Saw a very good photography exhibit in Rotterdam this past weekend, at the Kunsthal. The show’s titled “Bureaucratics” and it features square shots of various civil servants at their desks in offices around the world – I remember shots from Bolivia, China, Texas, India, several African countries, Russia, and more. 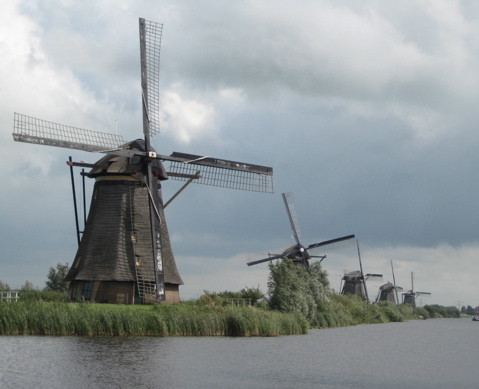 The photos are by Jan Banning, who in fact lives here in Utrecht. There’s a taste above, and you can see more on his web site (click on Photo Series / Bureaucratics to see lots of them). The shots from India are remarkable for the stacks and stacks of paperwork all around, whereas the African offices are nearly empty. This weekend I finally made it to an architectural landmark in Utrecht, the Rietveld Schröder House, built in 1924 on what was then the outskirts of town. Quite obviously a very modern and striking departure from the buildings of the time, it was commissioned by a woman named Truus Schröder, whose husband had died leaving her with three children. The architect was Gerrit Rietveld, who got his start designing furniture. 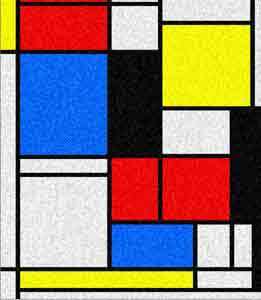 Rietveld’s design was inspired by the art movement De Stijl, most well known nowadays from the paintings of Piet Mondriaan (example below from 1921). 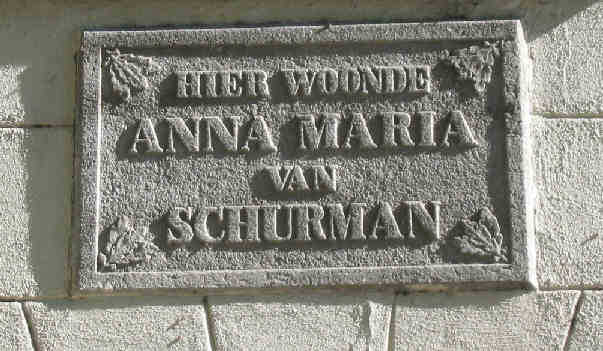 Remarkably Schröder lived in the house the rest of her life, until 1985, at which time the house was given to the Centraal Museum of Utrecht. She had changed very little in the interior, so the house today is virtually as it was over 80 years ago, with furniture designed by Rietveld and many interior design features by Schröder. She wanted an open living space upstairs, and this was achieved with a set of sliding walls that could be pulled out to divide the space or pushed back to open it up. The innovative use of windows and steel beam structural components made for a light-filled interior quite different from most Dutch housing of the time. Last weekend I happened upon a new museum show at the CoBrA Museum in Amstelveen, a suburb just to the south of Amsterdam. It’s a group show entitled “Neue Leipziger Schule” featuring the new generation of painters from Leipzig in the former east German, the most famous name at the moment being Neo Rauch. I wrote earlier about Matthias Weischer, another painter represented in the show. When I was in Leipzig this summer I went out to visit the art center that’s been created at the former textile factory complex, and found the gallery that represents Rauch and Weischer, discovering another painter that I quite liked, David Schnell. This show at the CoBrA features a couple more painters who have stylistic similarities to Schnell, and I’d like to see more of their work. The first is Martin Kobe – the images above are examples of his work – and the second is Ulf Puder, example below. These 3D worlds of partial architectures seem influenced by scenes created in computer games, and I find them to be very interesting to ponder. No, I don’t make any claim to understand them… assuming there’s something to understand above and beyond the visual interest inherent in these paintings. Enough financial news for the moment – back to some local coverage! Yes, always lots of bicycles around in Utrecht! Above you see a line up at an intersection. Below, a great customized Pink Panther bike, with room for two in the front compartment! 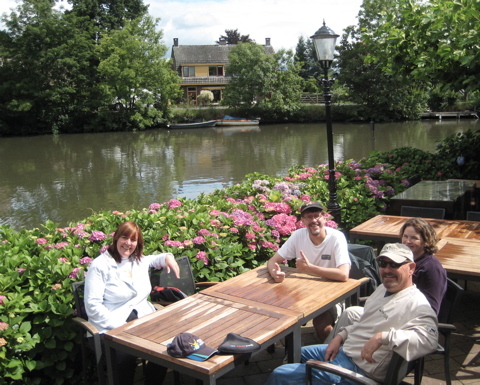 Here’s a shot from this past weekend, out on a bike ride with some co-workers, we stopped in at a fancy restaurant right on the canal, between Maarssen and Breukelen. Unfortunately this photo captured about the only 10 minutes of sun for the day! 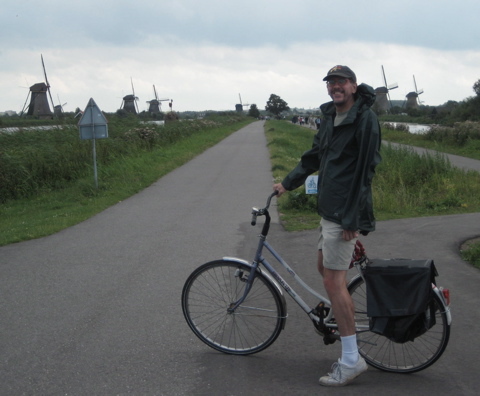 The rest of the ride was a little wet, but we did find a good place selling fresh cherries. Orange is the color of the day! That’s because Holland has gotten off to a great start in the Euro 2008 soccer tournament, with victories over Italy (3-0) and France (4-1). I’m not much of a fan really, but it’s great fun to see how the country has come alive and the national color is out all over. Read all the latest news on the Euro 2008 site. Update: Well, it’s all over now. Last night Germany lost to Spain, 1-0. A kind of surprising result after all the higher-scoring matches. I watched the Dutch lose to Russia in the Old Town Square in Prague, then saw the Russians lose to Spain a few nights later.